Seventeen of the game's best coaches showcase zone-busting offensive sets that are sure to wreak havoc against any zone defense. Master the art of out-scheming the most common zone defenses such as the 2-3, the 3-2, and the occasional 1-3-1 defense in order to secure the shots you want to take - not the ones the defense wants you to shoot. Geno Auriemma Series - The Hall of Fame coach shows you four plays to attack the 1-3-1 and 2-3 zone defenses. Two plays illustrate how you can attack through the high post, and two more make use of screens starting from different stack alignments to free up shooters. Fran McCaffery Series - A series of three plays that will help you score from inside and outside the 2-3 zone. Learn how to create opportunities for lob passes, post feeds and perimeter jump shots in addition to counters when the defense takes away the primary scoring option. Kermit Davis Series - Three plays for screening the bottom defenders in a zone to create inside scoring opportunities with post feeds or lob passes. Brad Brownell Series - Attack the 2-3 zone with ball screens using the Post Up play to force the defense to give up shots in the paint off a duck-in or allow open 3-point shots from the corner. Bill Self Series - Five plays for attacking zone defenses. 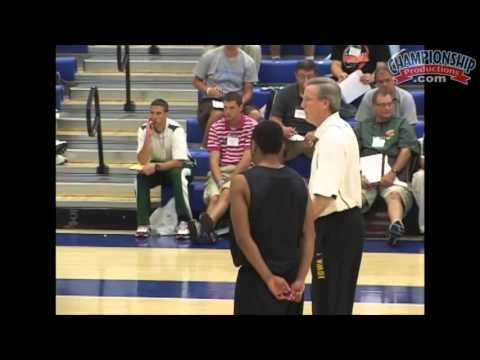 Coach Self shows two ways to deliver lob passes to a post or perimeter player of your choice. You also get three more plays, including his all-time favorite zone play, that allows you to strategically screen the zone to open up inside and outside shots. Bob Huggins Series - Coach Huggins walks you through different ways to read the defense in a play that makes use of a double screen and misdirection to score from inside the zone. Kevin Boyle Series - The four-time High School National Coach of the Year shares four plays that utilize high ball screens, baseline screens, and overloads to help you score with jump shots for your best shooter, post feeds and lobs. Tony Bergeron Series - Two plays for defeating the 3-2 zone. In addition to showing you how the baseline screens and pin screens of his Baseline and Push work, you will also learn additional ways to score when the defense takes away your first options. Tom Izzo Series - Five plays to dismantle zone defenses. Options illustrated include high ball screens, fake hand-offs, cross screens, and more that will help you find scoring opportunities at the rim or open looks for your best shooters.